Harvey and Juno were due for booster shots. Since the weather has been a bit nippy, I bundled up in my Carhartt, pre-warmed the car, then loaded Ray's kittens into their carrier and off we went. Harvey went first. 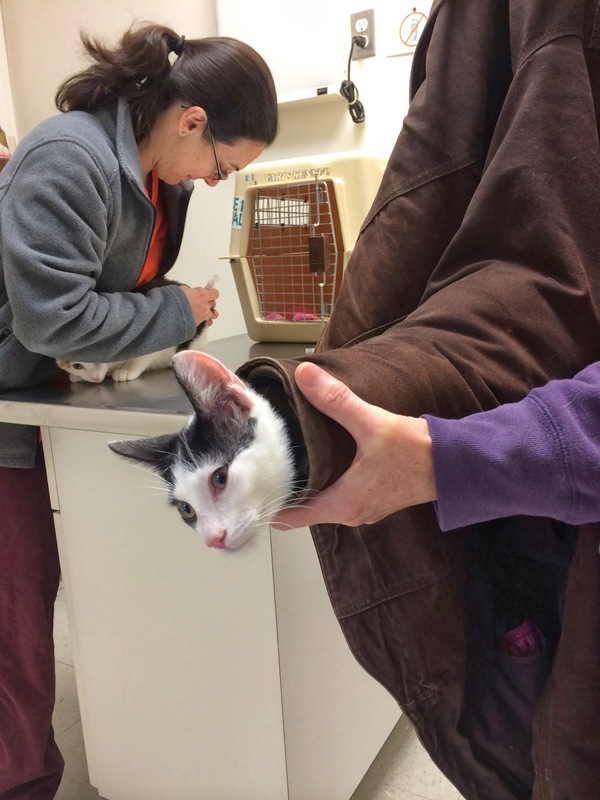 He took his shot like a kitten then jumped down onto the chair on which I had draped my coat, burrowing into the warm interior while the vet, Dr. Kopp, and I turned our attention to Juno. As Dr. Kopp readied the shot, I turned to Harvey to see how he was doing. I lifted a fold of the coat and peered inside. No Harvey. I lifted the coat from the chair to see if perhaps Harvey was underneath it. The garment was strangely heavy. 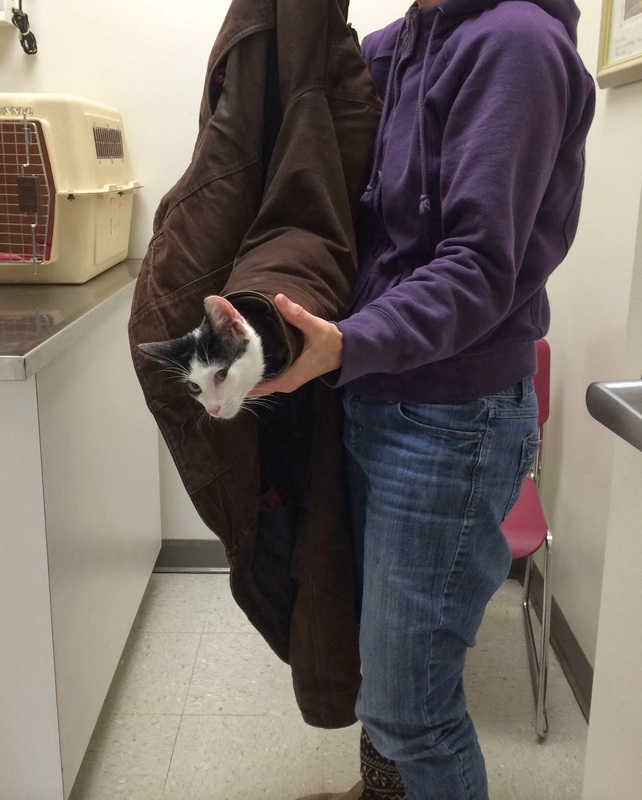 Not content with his original warm hiding place, Harvey had wedged himself into the unyielding fabric of the sleeve. As I lifted the coat higher, Harvey's head popped out of the cuff. While all the vet personnel came to see Harvey's magic show, I laughed myself silly. Juno, meanwhile, received her booster. (Juno) I wonder if there's enough room in that sleeve for me? I am Harvey the Magnificent. The sleeve trick is only one of my many illusions. Now watch me make a can of cat food disappear. *Thanks to Rosemary for the photos. Ray is still trying to find "the other one" and get a good snifff of him. Harvey is Ray's Hugo, always just out of nose reach. But, while Hugo was a lost cause, I have hopes for this little guy. Look how sleek and regal he's gotten! He is a handsome lad, isn't he? His coat went from coarse and dandruffy to smooth and dandruff-free. Amazing what good nutrition will do.